Five-year-old Alden Delgado, a student of San Pedro Roman Catholic Primary School, was knocked down by a taxi cab on Coconut Drive on Monday, September 12th, as he attempted to cross the street while on his way home for lunch. The taxi driver immediately picked up the boy and took him to the Dr. Otto Rodriguez San Pedro Polyclinic II, where he received prompt medical attention. The boy’s family told The San Pedro Sun that they were glad that nothing serious happened to Alden. They were grateful that the taxi driver was responsible in bringing their child to the health centre, and that he made himself liable for any expenses as a result of the accident. The family was also satisfied with the service provided at the polyclinic by the nurses who quickly tended to their son. “The medical personnel at the polyclinic were very quick in taking care of my son. I want to thank them for such a great service,” said the mother. After receiving medical treatment at the polyclinic, Delgado was released with just an abrasion to his right arm. According to the medical personnel at the health centre, no broken bones or internal injuries were found during the medical examination. They expect the boy to recover quickly and be back to school in a few days. According to The San Pedro Traffic Department (SPTD) similar cases like this one often go unreported since the respective parties make arrangements among themselves. However, the SPTD advises all drivers that they can be subjected to criminal liability when not complying with the necessary driving security measures. According to the latest posting on their Facebook page, the SPTD cautioned, “During the school time, we are asking all drivers of heavy and big vehicles to avoid the area around the Roman Catholic Primary School when students arrive and leave school, this includes lunchtime. This is a request and we are also warning that any drivers driving the type of vehicles mentioned above will be forced to park until students are safely in or out of the school,” states the message from the SPTD. 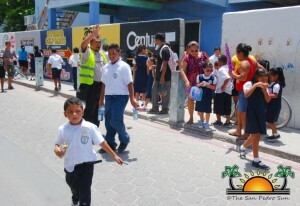 The Department will continue working with the community to keep traffic in order on the streets of San Pedro Town. They ask for everyone’s cooperation, in following instructions from traffic wardens in order to keep the streets safe, not just for students but for the public in general.